Sebaceous glands and sweat glands are the two types of exocrine glands found in the skin of mammals. Both sebaceous glands and sweat glands are located near hair follicles. Both glands secrete fluids onto the surface of the skin. 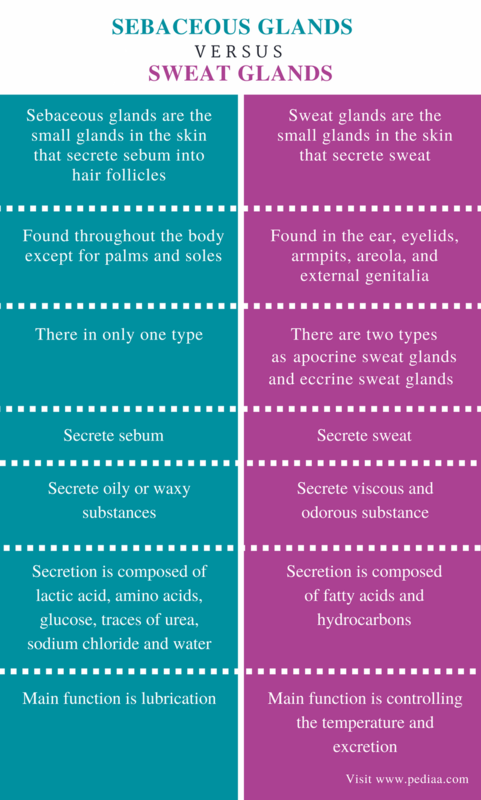 The main difference between sebaceous glands and sweat glands is that sebaceous glands secrete sebum into hair follicle whereas sweat glands secrete sweat. Sebum is an oily substance while sweat is a viscous and odorous substance. The main function of both sebaceous and sweat glands is to protect the skin from severe dryness. Sebaceous glands are the small glands in the skin that secrete lubricating oily matter, sebum into hair follicles. They are branched, acinar (spherical) glands found in mammals. The sebum is a fatty acid substance, secreted into the follicular duct and then to the surface of the skin. 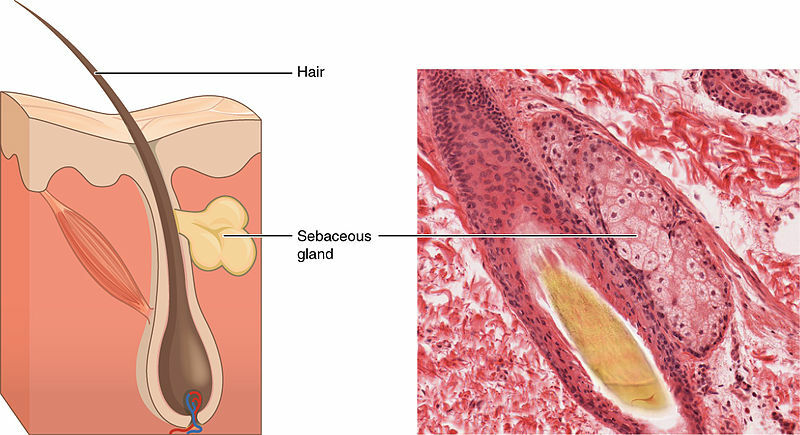 A sebaceous gland is shown in figure 1. The rounded cells in the sebaceous gland are filled with lipid vacuoles. These cells degenerate to release the contents into the duct. This type of secretion in exocrine glands is referred to as holocrine secretion. The sebum coats the hair and the surface of the skin to keep it soft and waterproof. The size and the secretory activity of the sebaceous glands increase at puberty, with the increasing levels of androgens in the body. When a sebaceous gland is blocked, the produced sebum is forced into the dermis. This may elicit an inflammatory response, causing acne. Sweat glands are the small glands in the skin that secrete sweat. They possess a simple tubular structure. Sweat glands are found in the superficial hypodermis near the border of the dermis. The duct of the sweat gland is also a coiled structure. It opens to the skin as a sweat pore. Sweat is a watery fluid that is hypotonic to the plasma. The evaporation of the sweat is important for thermoregulation. Sweat is composed of water, sodium chloride, urea, and lactic acid. A sweat gland in the skin is shown in figure 2. The apocrine sweat glands and eccrine sweat glands are the two types of sweat glands in the skin. Apocrine sweat glands are mostly found in smellier areas such as armpits, scalp, and genital regions. They are associated with the hair in those areas. The sweat of apocrine sweat glands is more odorous that the sweat produced by eccrine sweat glands. Eccrine sweat glands secrete sweat onto the surface of the skin directly. This means they are not associated with hair. Sebaceous glands and sweat glands are the two types of exocrine glands found in the skin. Both sebaceous glands and sweat glands are located near hair follicles. Both sebaceous glands and sweat glands secrete fluids onto the skin surface to protect the skin from severe dryness. Sebaceous Glands: Sebaceous glands refer to the small glands in the skin that secrete sebum into hair follicles. Sweat Glands: Sweat glands are the small glands in the skin that secrete sweat. Sebaceous Glands: Sebaceous glands are found throughout the body except for palms and soles. Sweat Glands: Sweat glands are found in the ear, eyelids, armpits, areola, and external genitalia. Sebaceous Glands: Only one type of sebaceous glands are found in the skin. Sweat Glands: Apocrine sweat glands and eccrine sweat glands are the two types of glands found in the skin. Sebaceous Glands: Sebaceous glands secrete sebum. Sweat Glands: Sweat glands secrete sweat. Sebaceous Glands: Sebaceous glands secrete oily or waxy substances. Sweat Glands: Sweat glands secrete viscous and odorous substances. Sebaceous Glands: The secretion of the sebaceous glands is composed of lactic acid, amino acids, glucose, traces of urea, sodium chloride and water. Sweat Glands: The secretion of the sweat glands is composed of fatty acids and hydrocarbons. Sebaceous Glands: The main function of the sebaceous glands is lubrication. Sweat Glands: The main function of the sweat glands is to control the temperature and excretion. Sebaceous glands and sweat glands are the two types of exocrine glands found in the skin. Both types of glands occur near the hair follicle. Sebaceous glands secrete sebum that lubricates the surface of the skin. Sweat glands secrete sweat that is responsible for thermoregulation and excretion. The main difference between sebaceous glands and sweat glands is the role played by them. 1. Paxton, Steve, et al. “Three types of glands.” The Leeds Histology Guide, 1 Jan. 1970, Available here. 2. “Sebaceous Glands – Definition, Function, Development.” Biology Dictionary. June 24, 2017. Accessed January 16, 2018. Available here.